Billie Eilish has spent much of her young, blossoming career gathering a mythic status about herself. The release of “Ocean Eyes” in 2016 introduced the world to the stunning voice of the also stunningly young Eilish. In the wake of the buzz, Eilish created with her debut single, relative silence followed. We’d hear one EP, 2017’s “don’t smile at me” along with sporadic singles released, but no substantive efforts outside of this. It wouldn’t be until 2019 when we’d finally get to hear Eilish’s full-length debut project. Titled “WHEN WE ALL FALL ASLEEP, WHERE DO WE GO?,” Eilish has finally given us an authoritative insight into who she is as a person and alternatively as an artist. Eilish has always extended a character with sharp edges, relegated to the dark and shadowy corners of artistic creation. She occupies a space solidly within her reality, fulfilling a perception of the angsty teen but doing so with the addition of odd and gothic themes. Primarily though, Eilish initially draws listeners with her angelic voice. Her singing is reminiscent of a Lana Del Rey who is a bit more grounded and content in their depression rather than being obsessed with dreamy recreations of life more suitable for happiness. Eilish’s debut album demonstrates this very principle. Eilish’s project is funnily nuanced with teenage immaturity – making it that much more credible coming from a 17 year-old singer who has consistently grown in fame since she was 13. Goofy sound bites, and even comical snippets from “The Office,” are sprinkled over tracks on the album but juxtaposed with deeply emotional topics and dark, broody instrumentals. The musical depth displayed on this album truly defines Eilish artistically and props up her efforts to evoke emotions within her listener. On “xanny” there are 40 seconds of Eilish’s soft and smooth voice slowly singing over a very minimal instrumental – followed by drums and an extraordinary amount of bass that is introduced to the track. This duality does a good job of defining the sound which it seems that Eilish has worked hard to perfect. Eilish uses the angelic nature of her voice on top of a beat so energetic with bass that it becomes distorted and warbled for the sake of aesthetic pleasure for the listener. “Xanny” is just one example of this. “you should see me in a crown” sees a dark, ethereal beat meeting it’s crescendo under Eilish speaking very plainly, “you should see me in a crown.” This approach allows Eilish to reinforce the mood which she is aiming for – dark and daunting. This does not sum up the entirety of this project by any stretch but it is worth mention as a significant dimension of this album. This production effort can be credited to Eilish’s partnership with her brother FINNEAS, who produces most of her music. Eilish started making music with her brother so the two have had as much of Eilish’s life as possible to perfect their craft and define their sound. Beyond the sound Eilish has managed to cultivate over the years, this album stands out in its clear artistic aim. The album art initially confronts a person and makes you wonder, what exactly they getting themselves into. 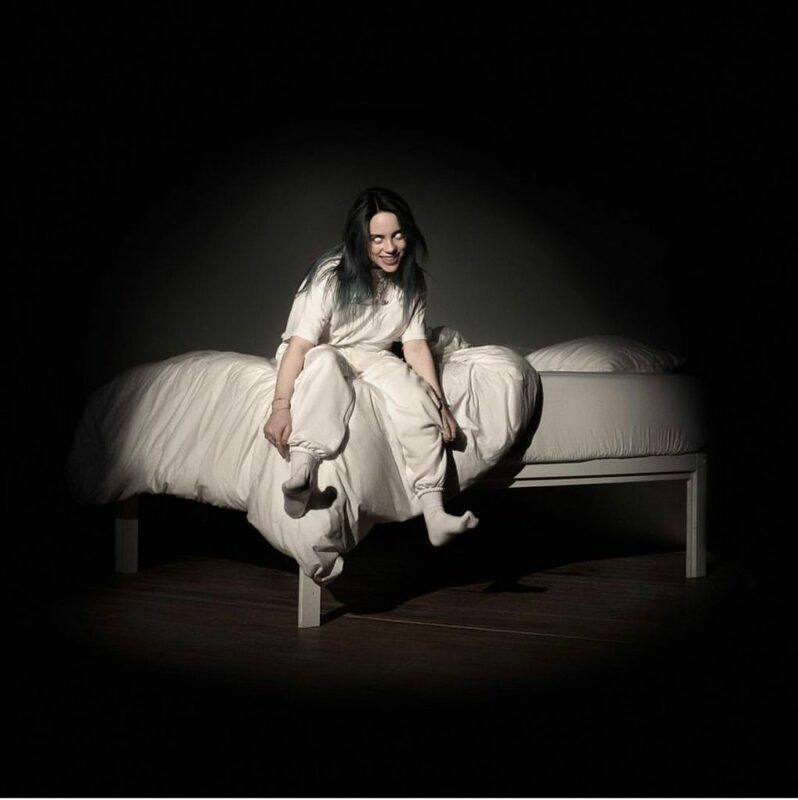 It shows Eilish creepily laughing at the camera from the edge of a bed with white contacts in place creating an overall creepy vibe. It’s this darkness that epitomizes Eilish’s creative direction but only the darkness which Eilish can portray in visually stunning ways. A solid palette of visually striking colors, disturbing images involving blood coming from places which blood should not be coming from. Visual tendencies like these of Eilish’s establish her creative style as weird but more importantly, something we’ve probably never seen in this iteration. Eilish’s ability to direct and control herself creatively places her above many of her contemporaries in terms of artistic success and viability. I would not be surprised to see Eilish become a worldwide megastar, she is definitely already on track.